I eventually found the Logitech Slim Combo and was really happy with it. I reviewed the 10.5″ version right after it was released last Summer and it was ok, but had some drawbacks. I got the 12.9″ version later on and found it to be so different that I wrote a separate review for it. This version fit its device better and also felt better in the hand. It also had a near perfect backlit keyboard, making it my favorite keyboard case out of all that I’ve ever used, and I’ve used and reviewed many over the years. The Slim Combo really fit how I use the iPad Pro to a tee. My 12.9 Pro has been my main writing device for a couple of years now, so a great keyboard case is pretty much a requirement for me at this point. Fast forward to today and I unfortunately find myself searching again. 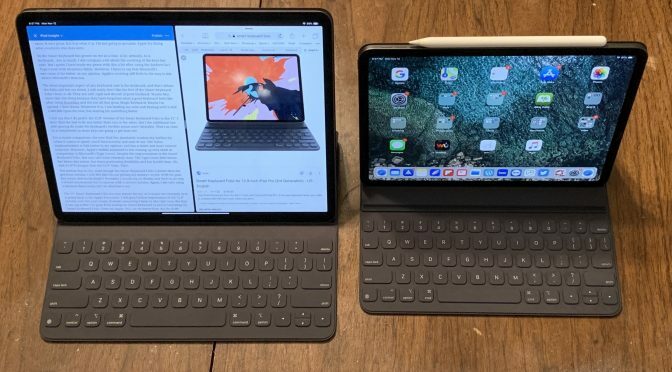 Logitech hasn’t announced anything regarding the new iPad Pros yet and there is also some debate over whether the new Smart Connector is even accessible to third party accessory makers yet. Brydge will be releasing a new Bluetooth keyboard and I am definitely interested in trying it, but there is no release date yet. Also, it only protects one side of the iPad when folded up, which leaves me with some reservations. I’ve looked at other options, but there are very few and, quite frankly, none of them look good. There is currently only one game in town when it comes to iPad Pro keyboard cases, and that’s my old nemesis- Apple’s Smart Keyboard. So here I am again, giving Apple’s strange mobile keyboard a third try. I went to my local Apple Store and dropped $400 on an 11″ and 12.9″ Smart Keyboard Folio. You read that right. FOUR. HUNDRED. DOLLARS. For perspective, that’s more than a base model iPad. One of the things I hated about the original Smart Keyboard was the fact that it didn’t cover and protect the back of the iPad. I know you could get a case to do that part of the job, but at its price point, I saw this as a big shortcoming of the Smart Keyboard design. Well, I have to give Apple a point back for the current design. The new Smart Keyboard Folio covers the entire iPad and has a much simpler overall design. It opens. It closes. It has two viewing angles. It folds back so you can use the iPad while it’s still on. That’s pretty much it, and that’s a good thing. I actually do like this year’s design and find it to be a big improvement over the previous Smart Keyboard. 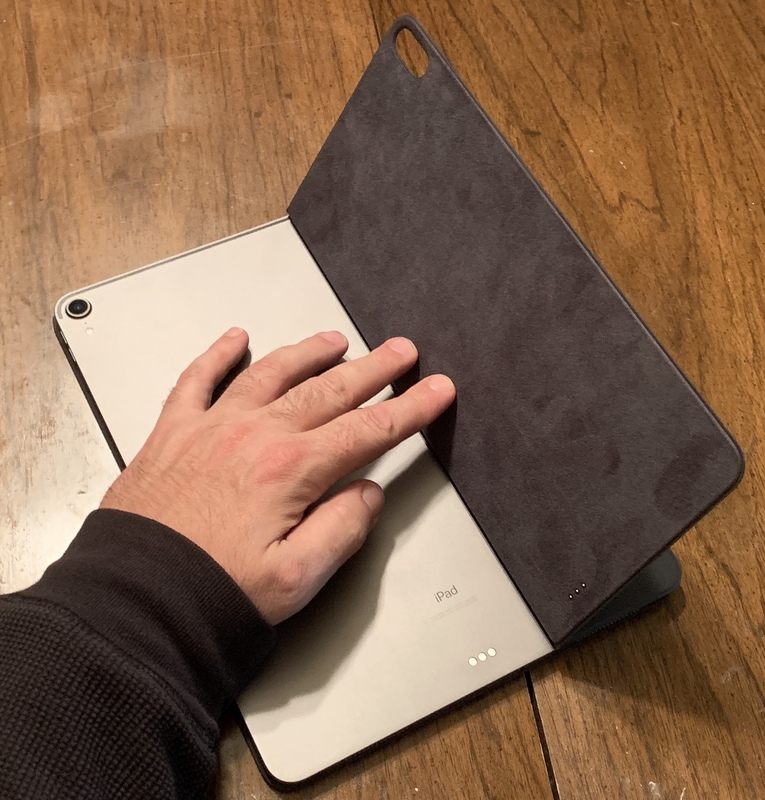 It is still super thin thanks to the fact that it simply attaches to the back of the iPad using magnets and the new Smart Connector. The new placement of this connector makes a LOT more sense after seeing and using this keyboard case. As a case, the Folio is enough to provide basic protection while on the go. I feel like it is a more complete product now in this regard and I appreciate that Apple improved protection while keeping it thin. I also like the feel of the case in the hand. It is extremely plain looking, but it definitely doesn’t feel cheap or flimsy. It is odd holding the iPad with the Smart Keyboard folded back, as you end up pressing on the keys. However, all I can say there is welcome to the world of 2-in-1 devices. My Lenovo Yogas have all folded back like this. My Surface Go does the same. It isn’t great, but it is what it is. I’m not going to penalize Apple for doing what everyone else does here. So the Smart Keyboard has grown on me as a case. A lot, actually. As a keyboard….not so much. I did complain a lot about the covering of the keys last year, but I guess I have made my peace with this a bit after using the Surface Go’s Type Cover with Alcantara fabric. However, I have to say that Microsoft’s execution is far better, in my opinion. Apple’s covering still feels in the way to me, where Microsoft’s is more of an enhancement. The most important aspect of any keyboard case is, you guessed it, the keyboard, and that’s where the Folio still lets me down. I still really don’t like the feel of the Smart Keyboard Folio’s keys at all. They are stiff, rigid and devoid of good feedback. I have been at it for a couple of days now and I am still very uncomfortable typing using this keyboard. I honestly can’t understand why many Apple fans actually like typing on this thing. Maybe Mac users have just forgotten what a good keyboard feels like after using Butterfly Keys and the not all that great Magic Keyboard. There I go again. The Smart Keyboard always gets to me. I know this is just my opinion and that others have very different ones when it comes to keyboard. That said, the Smart Keyboard Folio’s keyboard is still one of my least favorite of all time. Maybe I’m spoiled. I don’t know. Whatever it is, I am holding my nose and dealing with it and 1,000,000 typos for now, but waiting and watching for something better. Hopefully that something (or at least an announcement of it) comes before Apple’s Return period is up. 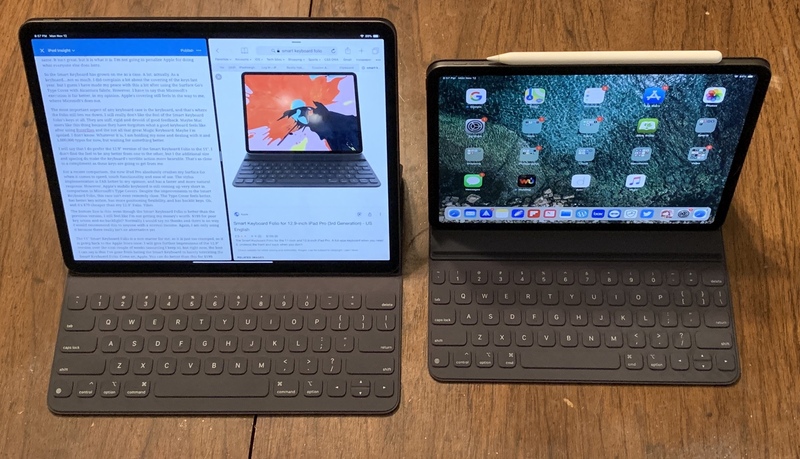 I will say that I do prefer the 12.9″ version of the Smart Keyboard Folio to the 11″. I don’t find the feel to be any better from one to the other, but I the additional size and spacing do make the keyboard’s terrible action more bearable. That’s as close to a compliment as these keys are going to get from me. For a recent comparison, the new iPad Pro absolutely crushes my Surface Go when it comes to speed, touch functionality and ease of use. The stylus implementation is FAR better in my opinion, and has a faster and more natural response. However, Apple’s mobile keyboard is still coming up very short in comparison to Microsoft’s Type Covers. Despite the improvements to the Smart Keyboard Folio, this race isn’t even remotely close. The Type Cover feels better, has better key action, has more positioning flexibility, and has backlit keys. Oh, and it’s $70 cheaper than my 12.9″ Folio. Yikes. While it only covers the screen, I’ll let that slide because of its many other positive features. The bottom line is this- even though the Smart Keyboard Folio is better than the previous version, I still feel like I’m not getting my money’s worth here. $199 for poor key action and no backlight? Normally I would say no thanks, and there is absolutely no way I would recommend this to anyone with a normal income. Again, I am only using it for now because there really isn’t an alternative yet. The 11″ Smart Keyboard Folio is a non starter for me, as it is just too cramped, so it is going back to the Apple Store soon. 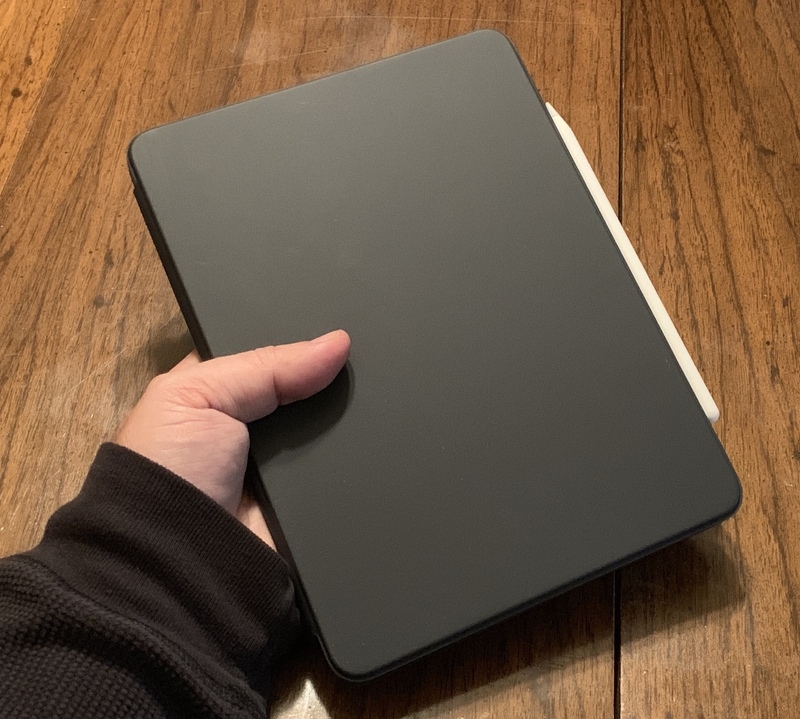 I will give further impressions of the 12.9″ version over the next couple of weeks (assuming I keep it), but right now, the best I can say is that I’ve gone from hating the Smart Keyboard to barely tolerating the Smart Keyboard Folio. Come on, Apple. You can do better than this for $199.